For as little as $240 you can help give a child a new smile and quite possibly the first teddy bear of their very own. Purchase the gift of a surgery ($240) and we will send a teddy bear on an Operation Smile medical mission to be hand-delivered to a child receiving surgery. To help remind you of your wonderful gift, you also will receive one of the commemorative bears for you to keep or share with someone special*. 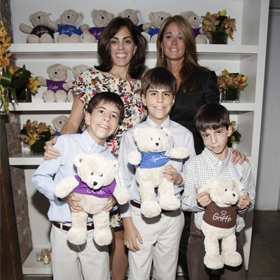 These plush bears were inspired by supporter Lisa Lori, whose three sons Zachary, Luke and Griffin were all born with facial paralysis. Lisa, her husband Mat, and her childhood friend Kathy Van Zeeland and her husband Bruce Makowsky work collaboratively on this project exclusively for Operation Smile. I would like to receive updates from Operation Smile.